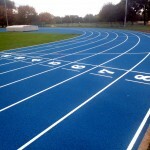 A Full PU Track specification on running tracks in the UK are pretty rare but are the premium top quality specification however this does come with a price and generally is the most expensive however many athletes would say you pay for what you get. These Polyurethane Athletics Track Surfaces are impervious so basically non porous and do not allow water to soak through the system. The make up of the Full PU Track surface is a base material flooded with two part flexible polyurethane elastomer and rubberized crumb cast insitu. 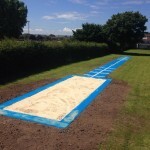 The solid PU athletics track wearing course surfacing is a layer of polyurethane resin binder with coloured EPDM rubber crumb cast into the uncured surfacing. The broadcast of the rubber EPDM granules can be carried out in blue, green or red colour with the most common being the latter and know to many as the tartan track colour Full PU Track. The advantages of the Full PU Track is that it is hard wearing, long lasting, high durability with energy boosting elasticity. 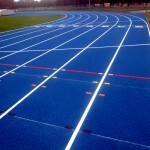 The Polyurethane Athletics Track Surfaces are perfect for spikes and an elite premium running track specification system. Athletics governing bodies of IAAF and UK athletics obviously approve this system however the Full PU Track Costs is clearly more expensive and for this reason in the UK there isn’t as many of these installed compared to the sandwich system or structural spray polymeric athletics surface. If you require Full PU Track Costs to build and construct a new running facility stadium or renovation of an existing track and field facility then please fill in the contact form where we can give advice on the costings and quotations on the works needed to be carried out. As the Full PU Track Costs more then this is the reason the specifications are generally designed towards high performance facilities like the Olympics and this system is specifically good for sprinting and the superior Polyurethane Athletics Track Surfaces design. This flooring option is also known in the market place as full pour athletics track system, solid PU track or multilayer solid polyurethane elastomer track system.